Stump grinding is a method of removing tree stumps by using machinery with a rotating cutting disc that chips away the wood. A stump grinder or stump cutter is a powerful piece of equipment that removes tree stumps by means of a rotating cutting disc with carbide tipped teeth. The teeth grind the stump to small chips that mix in with the surrounding soil. Quite a lot of waste can be produced and should ideally be kept as a great future compost. The void left can be back filled with the waste as a temporary measure. 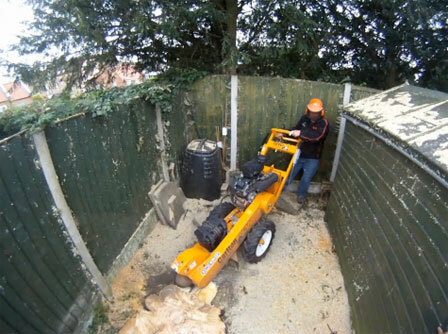 The video shows a stump grinder in action. 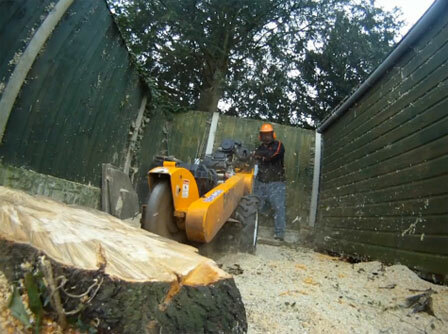 A stump grinder will achieve what a digger won’t as it can be targeted at the location of the stump area only. Digging a stump out for most people is not an option as it takes so much time and can often lead to back injuries. Most of the time we are able to grind the stump down to between 8-12 inches depending on surrounding obstructions. There will always be part of the attached root structure still present but at the depth ground out, most people are able to achieve their aspirations to re-turf or re-establish borders etc. Any stump or root left underground will rot away in time as it will withdraw moisture from the surrounding soil. Chemical treatment of stumps does kill off the stump but it still remains, protruding above ground level like a sculpture for years ahead. Choose the sensible option and have your stump ground out today. 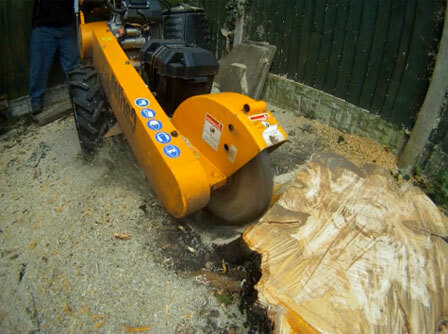 When we agree to grind a stump for you we provide you with a qualified operative who will have been provided with the correct personal protective equipment to ensure that the stump is ground down safely and professionally. He will check with you regarding the presence of underground services (please read our guidance on Health and Safety) and if necessary erect a shield barrier to prevent flying chips injuring passers-by or damaging property. He will then commence with the grinding, stopping occasionally to separate the build-up of waste and observing progress. He will observe the possibility of machine damaging rubble or iron. Afterwards he will level the ground-out area before re-loading the machine and ensure that you are happy with the result. There always appears to be a lot of waste but because the wheel has been spinning at such a high speed a lot of air is introduced into the soil/chip mixture. This will settle down within a few days leaving you to continue with your landscaping. The Carlton model SP2010 is designed to provide impressive cutting power in extremely tight places. This machine combines the convenience of a self-propelled transmission with a 27 horsepower engine in an extremely narrow package width. This enables access to most customers’ rear gardens as it is narrower than a standard door width. The model SP2010 impresses operators with its ease of use and powerful cutting ability. The self-propelled transmission provides both quick and powerful transport to the work area. This transmission provides infinitely variable hydrostatic speed control in both forward and reverse. 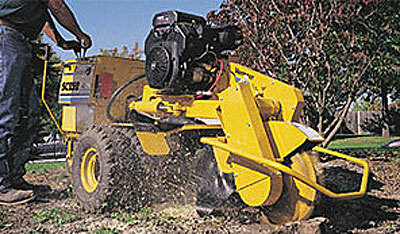 This superb stump grinder has features not found on similar looking grinders. The SP2010 sets the standard of self propelled pedestrian stump grinders. The model SP2010 provides an excellent solution for hard to get to stumps. Redefining industry standards – with similar design characteristics to its predecessor, the Vermeer SC252 unit, the SC352 stump cutter is targeted at filling the needs of contractors in the stump cutter removal market. The SC352 boasts the power necessary for right-of-way clearing jobs, but remains versatile, lightweight and compact to tackle those hard-to-reach stumps. As mentioned, underground services are a real danger to our operators. The possibility of electrocution and gas explosion are a frightening prospect and as a property owner you should be aware of what we expect to be provided with for the safety of everyone. We therefore would ask you about services before agreeing to start. We would ask about drains and water supplies, electric cables and gas pipes. We would ask you to check your own installation plans and ask you to confirm that they have been installed in accordance with HSE guidelines regulations are supported by HSE guidance ‘a guide to the pipelines safety regulations 1996’ and there is also a Health & Safety Commission (HSC) approved code of practice and guidance ‘design, construction and installation of gas service pipes’. Tree stump removal in Lincolnshire These publications refer to the Institute of Gas Engineers’ Guidance ‘IGE/TD/3 Distribution Mains’ and ‘IGE/TD/4: Gas Services’ which specify the minimum depth at which gas mains and services should be laid in order to minimise the risk of accidental third party damage. HSE expects mains and services to be laid at the depths specified in these publications unless other effective precautions are taken to minimise the risk of third party damage. A gas main should normally be laid with a minimum depth of cover of 750 mm in a road or verge and 600 mm in a footpath. A gas service pipe should normally be laid with a minimum depth of cover of 375 mm in private ground and 450 mm in footpaths and highways. However, these depths are only a guide and should not be relied upon when carrying out work near gas services or mains. It is in this instance that we would ask for confirmation that compliance with this has occurred and any change or alteration information provided. We would continue after this has been confirmed on the understanding that we do not accept liability for the resulting consequence of not providing this information or of the information supplied being inaccurate. It may seem a little harsh but it is in everyone’s interest to protect workmen and the public.